In the following we describe how to set/edit the RFC2307 attributes used by idmap_ad. This requires to have NIS extensions installed in your AD. To administer the UNIX attributes via the Windows GUI you should install the Remote Server Administration Tools (RSAT), if not already installed and enable the advanced view ("View" / "Advanced features"). Modifications on user and group objects will be done by the Domain Administrator, if you haven't set any delegations. ADUC, running on Windows 10 and Windows Server 2016, no longer displays the "Unix Attributes" tab in user or group properties. For details, see Missing Unix Attributes tab in ADUC on Windows 10 and Windows Server 2016. Right-click to a user account and choose properties. Navigate to the "UNIX Attributes" tab. Note: If you don't see this tab, you haven't installed the RSAT function "Server for NIS Tools". The other fields are not enabled until the "NIS Domain" is chosen. Fill the values as required. Hint: You can only choose a primary group that has had Unix attributes defined! Right-click to a group and choose properties. Note: If the tab isn't visible, you haven't installed the RSAT function "Server for NIS Tools". The other fields are not enabled until the "NIS Domain" is chosen, fill the values as required. Hint: It's not required to add users to the group in this tab! Winbind retrieves the account membership from the Windows groups (see "Member Of"-tab). 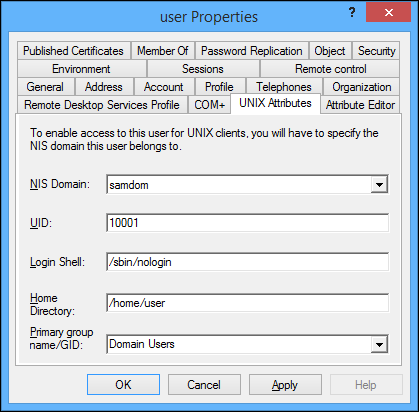 You need to set the uidNumber attribute to access samba shares on a domain with the Windows machine network account. Right-click to a computer account and choose properties. Navigate to the "Attribute Editor" tab. Scroll down to the "uidNumber" attribute, select it, click edit, enter a value, click "OK"
Note: Ensure that you enter a unique value. Every time a UID/GID number is assigned using Active Directory Users and Computers (ADUC), the next UID/GID number is stored inside the Active Directory. By default, ADUC starts assigning UID and GID numbers at 10000. This page was last modified on 22 November 2017, at 13:33. This page has been accessed 53,057 times.